Nine months ago, on a chilly January morning, the share fair steering committee and a group of other colleagues, met for a visioning session. At that meeting, we discussed the event's format, themes, audiences and agreed that we would organize an "out-of-the-box" event. We did our best to live up to this commitment. And hopefully this is reflected in the share fair provisional programme. Considering that the inaugural session is on the second day, the cocktail is on the third day and it finishes on a Thursday, I guess we can consider the second edition of the share fair an "out-of-the-box" event! But all kidding aside, as the saying goes, "the proof is in the pudding", and in 8 days time, we'll see whether we managed to live up to our vision. Rest assured that we put all our energy and passion into it. In preparing for this event, we took stock of the learnings and experience of the First Global AgriKnowledge Share Fair and the various regional ones. So hopefully, we've built on their strengths and addressed some of the challenges. One of the lessons learnt from the first edition was that we had to put in place a sound screening process to review the over 250 proposals that we received. We divided up this task amongst the steering committee. We met regularly over the course of a month to review and discuss the proposals making sure that we were doing the selection in a fair and transparent manner. So kudos to the 160 proposals selected. You guys for sure went through the wringer! Putting all our learning into action, we agreed that we would not have poster sessions nor booths. For this edition, we've introduced a tent which will have a chill-out corner and the speaker's corner. And we hope that many participants will use the speaker's corner to share their conversational or mainstream ideas, views and aspirations. We're looking forward for the chill-out corner to serve as a fertile ground for networking and connecting people. This edition of the share fair has the luxury of having four keynote speakers. Etienne Wenger, Rob Burnet and Mark Davies will be at the share fair. Michele Payn-Knopfer due to competing commitments will not be able to be with us in person, but will do her session via skype. Every day from 15:30-16:30 you can meet the keynote speaker of the day at the chill-out corner. Taking cue from the Addis share fair market place, we've introduced the show and tell session which will take place on 27 September from 17:00-18:00. This session will give participants an opportunity to showcase special activities and initiatives. If you are interested in this session, make sure you sign-up to secure yourself a slot. This share fair like all the others, will also have a knowledge tree. You will have an opportunity to adorn the baobab knowledge tree with your pearls of wisdom, ideas, learnings and thoughts. We particularly ask you to share with us what do you think are the value and impact of events such as the share fair. We love the law or even better the edict of no powerpoints. Share fairs are no powerpoint zones. So, if you are one of the few presenters who are planning to come with your 50 slide shows, better change your plans and adopt a knowledge sharing method or TedTalk/AgTalk format for your session. Discuss this with the facilitator assigned to your session. If you are "self-facilitating" your session and need help, give us a shout and we'll dispatch th rescue team! What does it take to organize a share fair? The short answer is commitment, passion, dedication, cooperation, collaboration, coordination, teamwork, preparation, attention to details, empathy, believing in and practicing "the art of possibility" and no prima-donnas. And we had them all or almost all. We were also blessed to have had the endorsement of IFAD management and the full support of our Chief Development Strategist who is also the KM champion. What has struck me most in this adventure, is what I call the process of natural selection. That is to say, we acknowledged and respected each other's strengths and weaknesses. As a result we ended up taking on tasks that we were good at. And believe me this happened in the most seamless manner without anyone realizing that it was happening. Almost a miracle. Next time you have to plan and organize a similar event, let the people on the team take on tasks and activities that they are good at. Do not force people to do things they are not good at - that is recipe for failure. One of the trademarks of the share fair brand is social reporting. The share fair will have a contingent of social reporters who will use social media (Twitter, blog, Facebook, Flickr, Blip.TV, YouTube, podcasting) to report live from the various sessions. The facilitators will be sharing the highlights of their respective sessions via a blogpost. We'll be using #sfrome. Thanks to social reporting methodology, we engage with those who are not in the room and are able to share their thoughts, inputs and ideas with those "in the room". We will be webcasting all the plenary sessions, keynote addresses and all the sessions held in the Italian Conference Room and the Oval room. We've integrated our webcasting with Twitter and Facebook - very much a la LiveStream - or dare I say even better! Over the course of months we put the logistic machinery in motion. Colleagues have been diligently processing visa requests and we hope that the approved visa requests will get then on time to attend the event. The last couple of weeks we've had meetings with the session presenters and facilitators, volunteers, administration, ICT and security colleagues. And we've learnt so much in this process. Now we know that for an event of this size, to ensure safety and security of participants and to make sure everything goes smoothly, we need to have extra guards, extra movers, have medical staff on the premises. This is why Willem was asked to "order an ambulance"! While we've tried to cover all grounds, for sure there will be things that we may have forgotten and there may be some glitches. When you encounter a challenge, please put on your creative thinking hat on, smile and find a way to overcome the challenge. 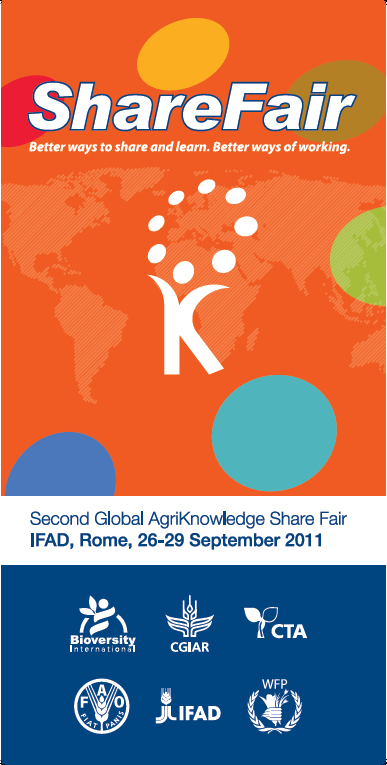 We look forward to welcoming the participants from more that 70 countries to IFAD headquarters. Please remember registration starts at 8:00am on Monday 26 September and do not forget your identity card and/or passport. See you next week.